Welcome to The Peoples Table Tennis Club. Calgary Alberta's only Self-Owned, Fully Licensed & Insured, Table Tennis Facility ! 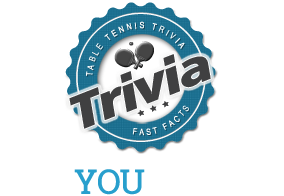 The Peoples Table Tennis Club proudly features Open & Tournament Play, Private & Group Lessons, Children's & Senior's Programs, Party & Event Rentals, a Pro Shop ...and a great deal more ! So take a moment to check us out & "Get your Ping Pong On !" Keep up with the latest News and Events happening here at the Club, as well as Fun and Interesting articles from across the Table Tennis World. As this section is constantly being updated, we encourage you to make this a regular stop, and to come back often ! Please note that we'll be closed December 24 - 26th 2018, December 31st 2018 - January 1st, 2019 for the holidays. Hope you're all staying safe and warm in this snow heavy winter! For Helpful tips and Handy Club information, we've compiled our most useful links all in one place ! NEW TO THE CLUB ? Whether you're New to the Sport, or New to our Club...its likely that you may have a question or two, about what to expect when you walk in our door. To make your first visit the best it can be, we'd like to help, with answers to your Most Frequently Asked Questions ! The Peoples Table Tennis Club is super easy to find! We are located at Bay 4, 700-33rd Street N.E here in Calgary, Alberta....just one block south of T & T Supermarket, the Pacific Mall, and Canadian Tire, and on the west side of the Marlborough LRT Station. Whether you plan to play daily, weekly, or simply find that your schedule is just too hectic to plan in advance, we offer a wide variety of pass and membership options, to suit every schedule and budget ! For a clearer "picture" of our Facility, its Features and our Club Events, take a moment to browse our Photo Gallery and Archives ! Pull up a chair....get comfortable...(...and pass the popcorn !!! ), as you watch a collection of Fun, Entertaining and Amazing videos, from The Peoples Table Tennis Club ! All Skill Levels are Welcome...You may never know the Fun you'll have, or the Friends you'll make !! !